We’ve been having some fun around here celebrating the Dog Days of Summer—library-style, but did you know there’s a way you can make a big impact this month? August 18 is this year’s Clear The Shelters event, a day of free adoptions at animal shelters across the country. Clear The Shelters was started to raise awareness for homeless animals and find these pets their forever homes. 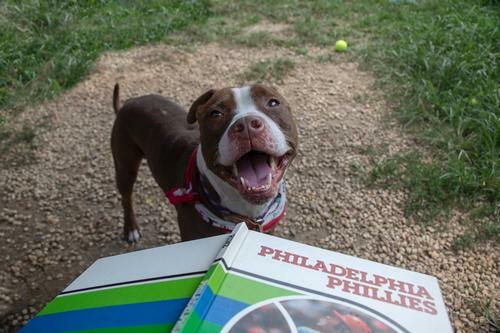 This year, ACCT Philly—Philadelphia's animal shelter—has a goal of finding adopters for every adoptable animal at their shelters! As the Philadelphia region’s largest municipal animal shelter and only open-intake shelter, ACCT Philly has historically hosted one of the largest CTS adoption events in the city. The goal of this event is to literally clear the shelter of all adoptable animals through adoption and foster placement. That’s right, if you can’t adopt right now, you can still make a difference by fostering! Of course, dogs are no strangers to the Free Library—the PAWS Read to a Dog program takes place at several library locations and at which children are encouraged to practice their reading skills in a non-judgmental environment by reading to a visiting therapy dog. As if we didn’t love them enough already, some of these Very Good Dogs were excited to pose with their favorite books! All this week, we’ll be sharing photos of ACCT’s adoptable animals on social media – check them out at #FLPDogDays and share to help them find a loving forever home! August 18 is this year's Clear the Shelters event, a day of free adoptions at animal shelters across the country. Great post! The library has wonderful resources both in digital and print format to help with questions and concerns new pet owners may have about the care of their new furry friend. The section on dogs in the Dewey system begins at 636.7. If you are at Parkway Central, you would find that section in the Business Resource Innovation Center on the second floor. Great way to combine love of reading with love of dogs. PSPCA (www.pspca.org) on Erie Avenue is participating in the national Clear the Shelter Day on Saturday, August 18, 2018 also. No adoption fees. Get a good book and a good dog and you'll never be in want! Thanks. Add a Comment to Make a Difference During these Dog Days of Summer and Adopt a Furry, Four-legged Friend!